Yesterday at Microsoft’s Worldwide Partner Conference, the company announced officially that Windows 8 is on-track to reach the Release to Manufacturing (RTM) stage in the first week of August, with general availability to come later in October – essentially confirming many thoughts of the industry on when Windows 8 would be released. There was no word at the event on when Windows Server 2012 would be released, but a post today on the Windows Server Blog reveals that the operating system will also RTM in the first week of August alongside Windows 8. General availability will be in September (earlier than Windows 8) through “multiple channels”. The Release Preview of Windows Server 2012 has been downloaded over 500,000 times, according to the blog. Come September, it will definitely be interesting to see what differences there are between the shipping version of Server 2012 and the RP. Microsoft’s Tami Reller has just announced at the Worldwide Partner Conference that the Windows 8 Release to Manufacturing (RTM) stage is on track for the first week of August, with a general availability occurring in October; devices are expected in “late October”. When the product does ship, it will be available in 109 languages across 231 markets worldwide. Previously it was speculated Windows 8 would reach RTM in late July, but this rumours has since been quashed with the first official word at WPC 2012. There could be a possible RTM sign-off in the coming weeks of July, but the actual release will occur in early August; so it’s not very far away at all. The official Windows Server 2012 page shows all four versions along with a brief description of each feature. The pricing ranges from $425 for Essentials up to $4.809 for the Datacenter SKU. One of the versions, Foundation, has no price listed, with Microsoft saying it is just for OEM businesses. Microsoft’s efforts to offer a version of Windows Server specifically for home server use have now changed. As revealed today in a new PDF FAQ document for the just announced Windows Server 2012 Essentials, the company announced it won’t continue to offer new versions of its Windows Home Server product. Windows Home Server has seen its greatest success in small office/home office (SOHO) environments and among the technology enthusiast community. For this reason, Microsoft is combining the features that were previously only found in Windows Home Server, such as support for DLNA-compliant devices and media streaming, into Windows Server 2012 Essentials and focusing our efforts into making Windows Server 2012 Essentials the ideal first server operating system for both small business and home use—offering an intuitive administration experience, elastic and resilient storage features with Storage Spaces, and robust data protection for the server and client computers. The first version of Windows Home Server was launched in 2007. It was accompanied by server hardware made specifically for the operating system, including HP’s MediaSmart Home Server. However, the home PC server market never really caught on with the general public. The last major version of Windows Home Server was released in March 2011. As we get closer to the releases of new products, naturally we expect some things to leak out. Today’s leak is that of the new Office 2013 application icons, courtesy of LiveSide, which reveal a Windows 8 logo inspired theme is making the rounds at Redmond. Below we have icons for both OneNote and Excel that show off the new look for Office. A few weeks ago, Microsoft announced that it would offer Visual Studio 2012 Express for software developers. However, the Express products were limited to Windows 8 Metro apps along with one for Windows Phone apps and one for web development. At the time, Microsoft said it would not offer a version of the free software for desktop app makers. This decision angered a lot of software developers. Adhering to the core principles weâ€™ve set for our Express products, Visual Studio Express 2012 for Windows Desktop will provide a simple, end-to-end development experience for developing Windows desktop applications targeted to run on all versions of Windows supported by Visual Studio 2012. With this new Express edition, developers will be able to use C++, C#, or Visual Basic to create Windows desktop and console applications. Developers will also get access to new advances available across the Express family in Visual Studio 2012, such as the latest compilers and programming language tools, integrated unit testing, and the ability for small development teams to collaborate via Team Explorer and TFS Express. The blog added that Visual Studio 2012 Express for the desktop will be a great learning tool for students and will also serve as a way for open source applications to be ported to earlier and current versions of Windows. The desktop port of Visual Studio 2012 Express will be released in the fall. With the recent announcement of the Windows Server 2012 Release Candidate (RC), we at Bing.com considered how we might benefit from some of the operating systemâ€™s new features. Bing.com is a cloud service that runs on thousands of computers spanning many datacenters across the globe. Performance is a key component in running a successful cloud service such as Bing. Bing serves thousands of user queries every second, and users demand both relevancy and speed in those results. Today, Windows 8 Release Preview is available for download in 14 languages. This is the final pre-release, and includes Windows 8, Internet Explorer 10, new Windows 8 apps for connecting to Hotmail, SkyDrive, and Messenger (and many more), and hundreds of new and updated apps in the Windows Store. The next release of Windows Server, Windows Server 2012, will offer businesses and hosting providers a scalable, dynamic, and multitenant-aware, cloud-optimized infrastructure. It securely connects across premises and helps IT Professionals to respond to business needs faster and more efficiently. Need more information? See the product details page. Remote Server Administration Tools for Windows 8 Release Preview enables IT administrators to manage roles and features that are installed on computers that are running Windows Server 2012 from a remote computer that is running Windows 8 Release Preview. Visual Studio Professional 2012 RC can help you create applications that have innovative user experiences that delight your customers. The integrated environment helps make complex tasks easier so that you can focus on achieving your goals. Earlier in May, Microsoft revealed a number of changes it was planning to make to Visual Studio 11 in between the current beta version and the upcoming release candidate build of the software development tool. Now Microsoft has revealed the final product lineup for Visual Studio 11 (technically, a codename for what Microsoft will likely call Visual Studio 2012 when the final version is released). Another major improvement that is coming is the multi-monitor taskbar that many users have complained about the lack of in Windows 7. 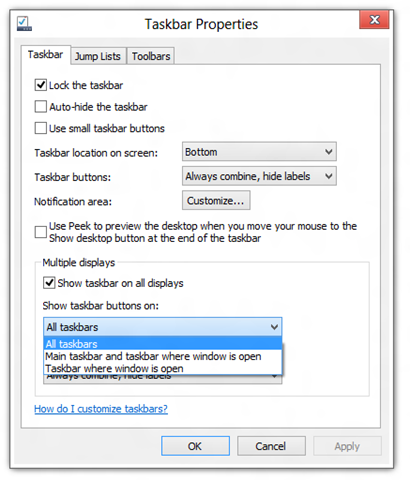 In Windows 8, users will have the option to show the taskbar on secondary monitors, and then there will be options to choose how the application icons are shown on these taskbars. By default the app buttons will be shown on both taskbars, but you can set it to show app buttons only on the taskbar belonging to the monitor where the application is open.